A tropical celebrity playground in the 1950’s and 60’s, Brazil has enchanted Brigitte Bardot and Rita Hayworth, and now more recently, served as a backdrop for Snoop Dogg’s “Beautiful” music video in 2002. 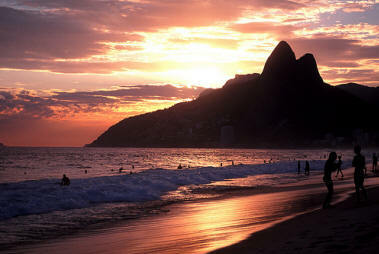 Only a stone’s throw away from Argentina, a flight to Rio de Janeiro takes only three hours from Buenos Aires. I, like many others before me, couldn’t resist the temptation to explore the flavors of South America’s most seductive country. My days started out with deliciously cold coconut water from the whole coconut. Afternoons were sweetened by fresh passion fruit juice. As I beach-hopped through Rio de Janeiro, Buzios, Cabo Frio and Ihla Grande I was enchanted by the culinary exoticism of words I hadn’t heard before. I had trouble understanding even the English-version menus that were dressed with words such as catupiry, guaraná or moqueca. Strolling through the multitude of fresh produce stands and vendors at the open fruit and vegetables market in Ipanema, I was lost amongst the mix of Portuguese and culinary vernacular, and the sights, sounds and smells of the strangest and funniest looking goods. I found myself in a world of persimmon, coconut, guava, cassava, passion fruit, star fruit, acerola and fruta do conde. This curious offering found its way to the juice bars that prevailed throughout my travels. Açaí (pronounced ah-SIGH-ee) was most prominent with huge banners sprinkling the sidewalks of Rio de Janeiro and the dirt roads of Ihla Grande. Served as a brilliant reddish-purple iced smoothie in a little plastic cup, açaí is nature’s super food, packed full of antioxidants, amino acids and essential fatty acids and harvested in the palm trees of Brazil. (As a side note, I met a fellow traveler who had caught the now-popular dengue fever and was drinking açaí everyday to recuperate.) The sweet, sour and nutritious chlorophyll-and-orange juice was another one of my favorites. 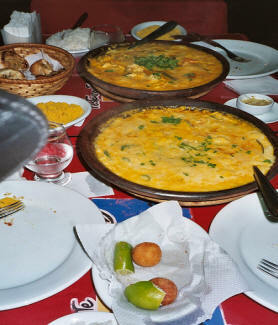 Brazilian cuisine in and around Rio also specializes in fish and seafood which comes whole — fried or roasted — or in soups and stews, with a side of rice and black beans. A seafood fanatic, I was on a constant search for Bahian food from the northeast of the country. With ties to colonial Brazil, Bahian cuisine evolved from plantation cooks who improvised on African, Indian, and traditional Portuguese dishes with local ingredients. Typical dishes include vatapá (creamy paste of bread, shrimp, coconut milk, palm oil and nuts), caruru (a stew of okra, onion, shrimp, nuts and palm oil), acarajé (a deep-fried ball of white beans) and moqueca (slow-cooked stew of seafood, onions, tomatoes, cilantro and chili pepper). I enjoyed a taste of each dish, and more, at a buffet-style lunch at Siri Mole e Cia in Copacabana after a trek up Corcovado Mountain to see Christ the Redeemer earlier that day. In Rio, feijoada (a black bean, pork and beef stew) is popular especially as a Wednesday or Saturday lunch. Prepared over a slow fire in a thick clay pot, feijoada comes with sides of rice, couve mineira (chopped and stir-fried collard greens), farofa (roasted cassava flour), and hot pepper sauce (a lovely addition to my collection of hot sauces, it consists of whole red malagueta chiles steeped in palm oil or olive oil for a month or so). The Adega da Velha in the bay area serves up some of the best feijoada in town. 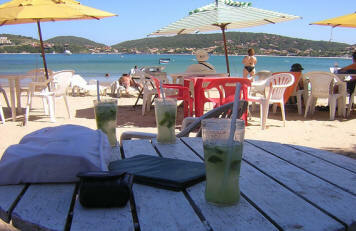 Though hard to choose, I had one of my most memorable dining experiences at the beach-side Nannai Bar in Buzios, a vacation hot spot for many wealthy Argentines. The sun was setting over the nearly secluded Ferradura Beach; the waves were lapping lightly against the shore and I had gleefully ordered a dozen oysters on the half-shell. As I sat sipping my cold Itaipava beer, I saw a fisherman drag a net full of oysters into the bar, and moments later, heard shucking noises. The waiter came by after a few minutes with a plate full of freshly-caught-and-shucked oysters! They certainly weren’t the prettiest oysters I’ve seen, but, boy, were they tasty. Mild and slightly sweet they were adorned only with a few drops of squeezed lemon slices and a couple dabs of hot sauce. Aside from the traditional Brazilian cuisine, I also made several stops at the popular and trendy sushi chain Koni, which serves up only cones or hand rolls of tuna, salmon and shrimp with ingenious press-down bottles for soy sauce with wasabi or teriyaki sauce. 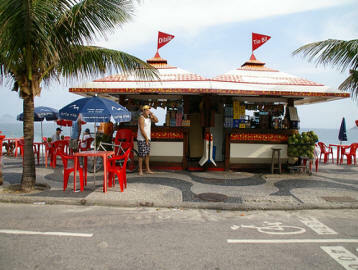 For other afternoon and evening snacking during pit stops between beaches, I hopped into the many bakeries aligning Rio’s streets for fried codfish balls, ricotta and spinach balls, pastels of meat or cheese and cheesy bread. Having now stepped out of the golden sun and translucent turquoise waters of Brazil and into the crackling leaves that signal the onset of autumn in Buenos Aires, I have an incredible longing for carioca food, music and style. But I can actually find authentic flavors of Brazil here in Buenos Aires. The nightclub Maluco Beleza emanates with the sounds of samba and zouk, a new-found favorite of mine. And I can revisit the tastes of feijoada and caipirinhas at Me Leva Brasil and Maria Fulô in the neighborhood of Palermo. This article originally appeared with our friends over at: Argentina’s Travel Guide, the internet’s premier online guidebook to Argentina featuring articles, suggested destinations, photos, a forum, and a free Pocket Guide Series.